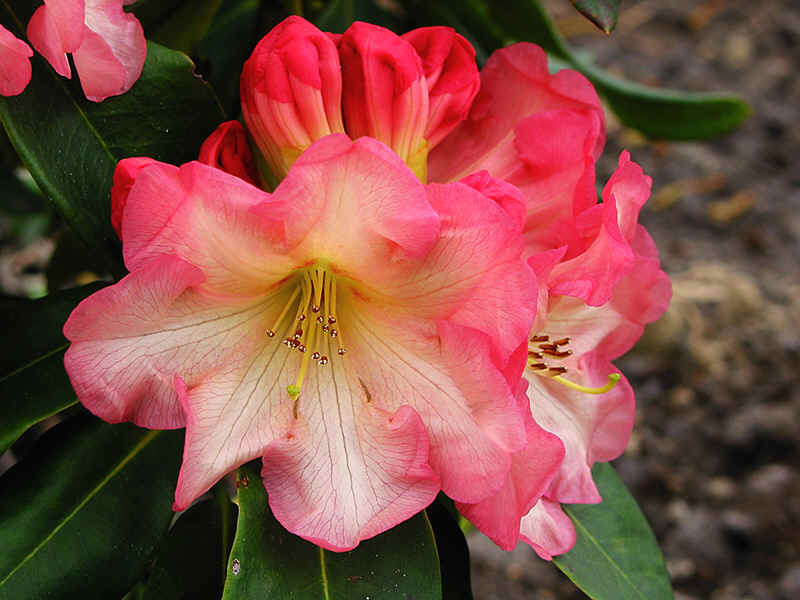 Rhododendron and Azaleas belong to the family of the Ericaceae, the 'heather family, which includes about 200 species of plants. 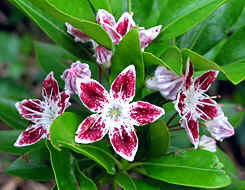 Some of these species are the Vacciniums, Gaultheria, like G. procumbens, known for their nice red berries. The Calluna vulgaris, the genus Erica, Arctostaphylos uva-ursi, Andromeda. 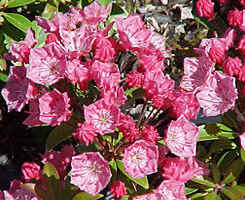 And some Leucothoë varieties, Enkianthus, the Enkianthus campanulatus. etc. 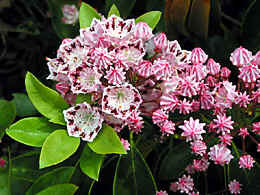 I plan, to write a new page about them, as soon as I have some time......Well, now about the beautiful Kalmia latifolia. 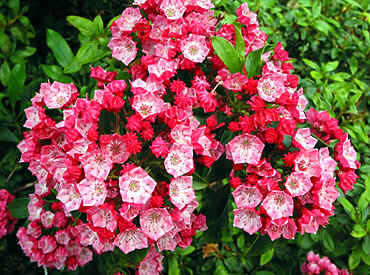 Certainly, there is at least one genus that fits into a garden with rhododendrons and azaleas - Kalmia latifolia. 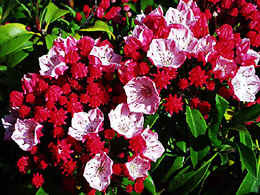 I have some varieties in my garden, about 15, and when I have guests in my garden and they see them in full flower, they are amazed about their beauty! And why? Well, they did not know them before. 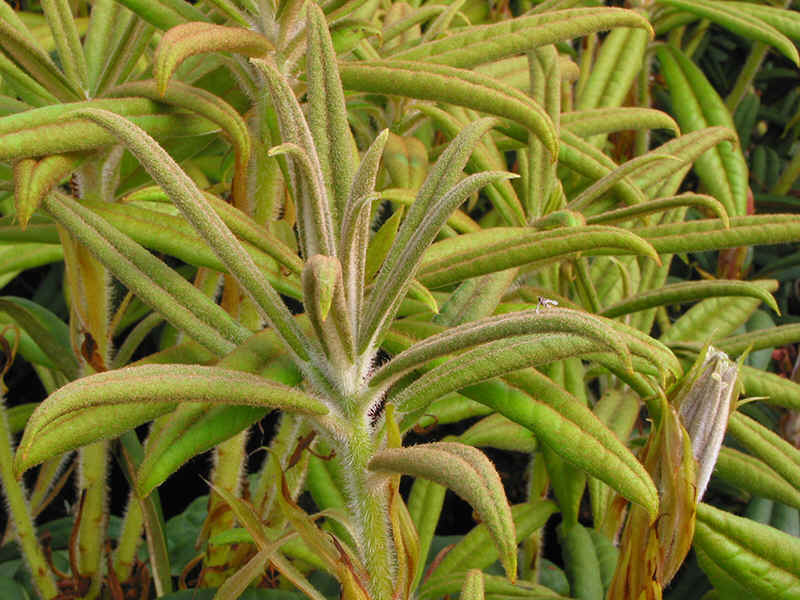 I think, they are more well-known in the USA, where the original species grow in the wild and where more nurseries and laboraties propagate them. 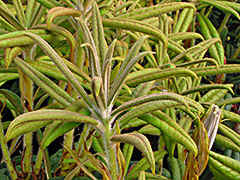 Propagating by cuttings or graftings is hardly possible, because most of the varieties will not root. 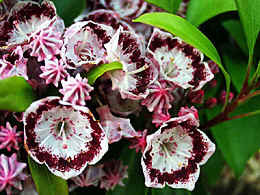 So, it is easier to propagate them by TC-culture. 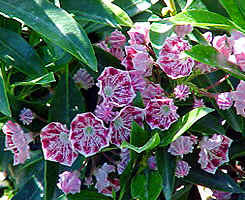 The genus Kalmia latifolia is indissolubly connected with Mr. Richard A. Jaynes in Hamden, Connecticut, north of New York. 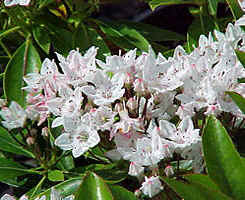 In the winter of 1994 I visited his 'Broken Arrow Nursery' and laboratory and admired his rows of small TC-culture plants of Kalmia latifolia and other Kalmias. He is the real Mr. Kalmia himself. 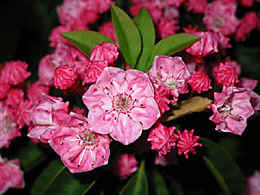 He has written a book about it, "Kalmia, Mountain Laurel and Related Species" and already the 4th (? )edition has been released. It calls him a 'laurel fanatic'. This book is a must for anyone who is interested in the wonderful genus. I won't give you now a sort of summary of his book, but will mention some important aspects. 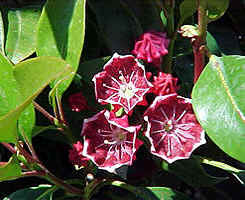 These plants grow in the wild in the eastern part of the USA from Florida to Canada. Normally they grow as high as 10 to 20 feet. 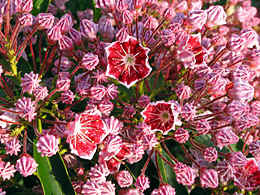 The flowers are in trusses of about 10, 20 to even 30 seperate flowers, from dark pink to almost white. 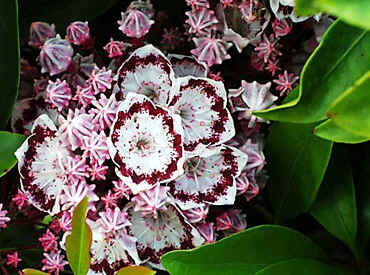 There are many banded selections, like 'Kaleidoscope' or 'Minuet', a small growing variety. Now I feel the temptation to mention many of them, but you really must read the book of Richard Jaynes or buy the plants. The beauty is ....I can hardly find the right words, magnificent and beyond expectation. In 1994 I was in the USA, in the woods of the 'Blue Ridge Mountains' in North- and South Carolina. I enjoyed it very much! I hope to be there this year again!! 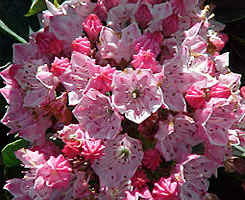 Kalmia latifolia is one of the Ericaceae and fits very well into a garden with Rhododendrons, azaleas and other plants of this family. 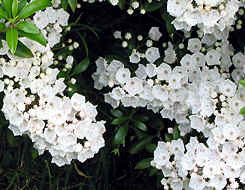 And desires the same conditions, soil, pH etc., though it withstands better drought. 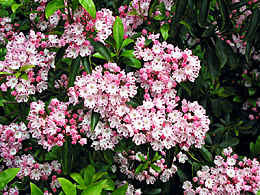 It is completely cold hardy and wintergreen, so it gives your garden some colour in winter. 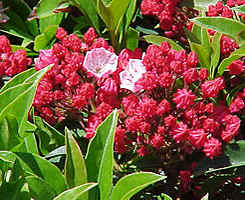 There are also small growing varieties, like 'Elf' and 'Minuet'. Availability must not be a problem in the USA. In other countries it might be more difficult to 'lay your hand on them'. Just look on the internet, go to the better gardencenters and order them. 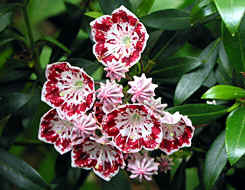 You must try to get them, because they are so beautiful!